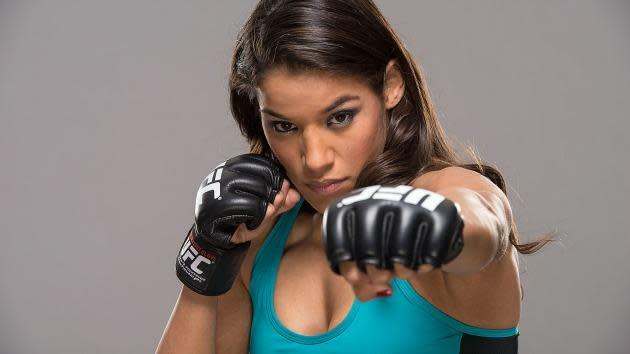 Before her winning TUF 18 finale bout, Julianna Pena made waves by calling UFC bantamweight champ Ronda Rousey a "spoiled, rich brat," and "pretentious" during an interview on Fox Sports 1. Pena is friends and training partners with Rousey rival Miesha Tate and chaffed at Rousey's harsh assessment of her before and after Pena upset TUF 18 Team Rousey member Shayna Baszler. After winning TUF 18 Saturday night, Pena clarified her remarks about Rousey but did not back off of her criticism. "Whether Ronda has one penny or $10 million, the point I was trying to make there is she has her nose in the air and she acts like she's better than everyone else," Pena said during the post event press conference. "If [Rousey] was so real, why didn't she tell me that I didn't deserve to breathe the same air as Shayna Baszler? Why didn't see tell me that to my face instead of saying it on camera behind my back?" Pena said that it isn't about how much fame or money Rousey has, just an overall arrogance that rubs the TUF 18 winner the wrong way. "It's her arrogance. It's the way she holds herself, like her [expletive] don't stink. That was the point I was trying to make. It doesn't have anything to do with money. It's the way that she acts," Pena explained. The 24 year-old UFC newcomer would seem to welcome a fight down the road against Rousey as well, to back up her talk. "I'm probably like two or three fights away [from a title fight]," she said. "Maybe one. Maybe they'll put me up against the next champ right after this. Who knows? It's not my decision."